Just in time for Sunday brunch – I needed bread that would go great alongside eggs and mimosas. 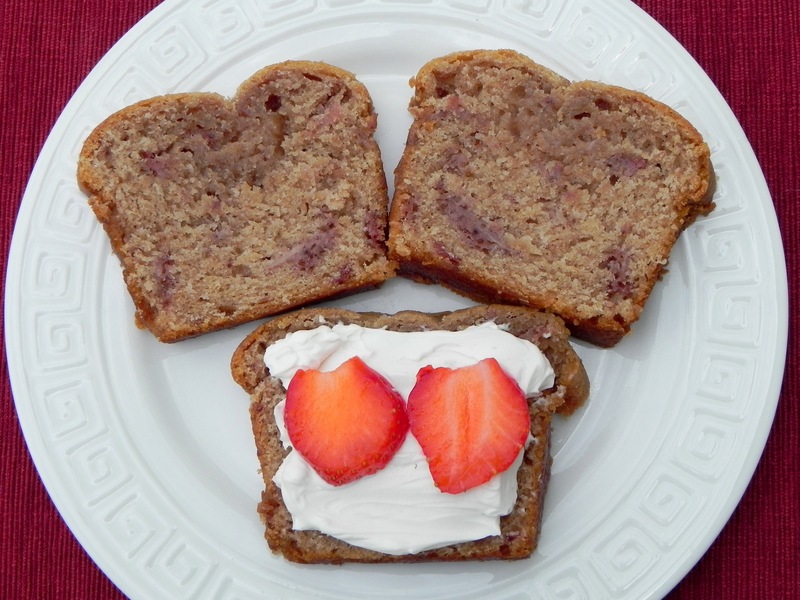 Strawberries are available everywhere so they were my first choice to flavor a bread. A short search of my files revealed a recipe for a vegan quick bread that incorporated these lovely berries. For altitude I reduced sugar and baking soda. I added milk, although there was none, to help with dryness at altitude.To make it a little healthier, I took out some regular flour and put in whole wheat. The last change was substituting ginger for cinnamon, but that was merely to please my own taste buds. Add vegan cream cheese and fresh strawberries to a slice, and you’re set. Preheat oven to 400F. Grease 3 cavities of a mini loaf pan. In a large bowl, mix sugar and oil. In a small bowl, combine arrowroot and applesauce, then add to large bowl and stir. Stir milk and strawberries with juice into sugar mixture. Add baking soda, baking powder, and lemon juice, and whisk to combine evenly, without lumps. Stir in vanilla and ginger. One cup at a time, add flours and stir to incorporate into a smooth batter. Pour batter into prepared loaf pan. Bake for 30-33 minutes until tops turns golden brown. Remove to a wire rack and run a knife around the edges of each loaf. Allow loaves to cool for at least 10 minutes before turning them out to cool completely on a wire rack. Once in a while I get lucky. 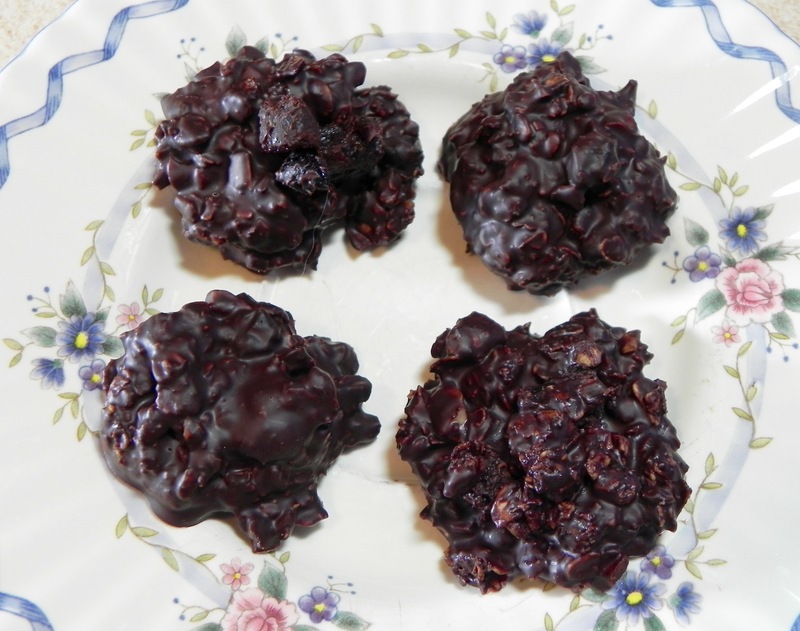 I find a recipe that’s already vegan that doesn’t need much changing for altitude, and it works when I bake it! This recipe was one of those. My gluten free friends deserved a treat so I went searching and found this cookie recipe that didn’t need much finesse from me. The adaptations I made were mostly due to the fact that it was a “pre-make the dry ingredients and dump” recipe. I altered the directions to make a smoother batter when the ingredients were added individually. The one nod I made to high altitude was to add more water to account for dryness, and the fact that I swapped the coconut for more oatmeal and it loves to soak up moisture. Preheat oven to 350F. Line a cookie sheet with parchment paper. 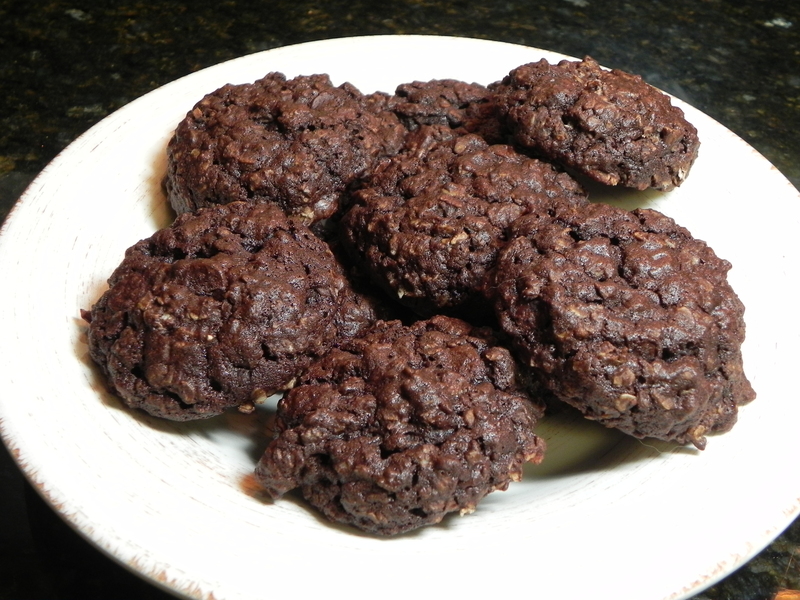 In a bowl, mix together cocoa powder, flour, baking soda, and salt. In the bowl of a stand mixer, cream applesauce, buttery spread, vanilla, and water. Add in both sugars and beat until creamy. Add in cocoa powder mixture and beat again. Stir in oats and chocolate chips by hand. Let dough rest for 10 minutes so it will absorb the liquids. Drop spoonfuls of dough onto prepared cookie sheet. Bake for 17-19 minutes. Makes about 24 cookies. My usual breakfast of oatmeal with nut butter and fruit was getting old. 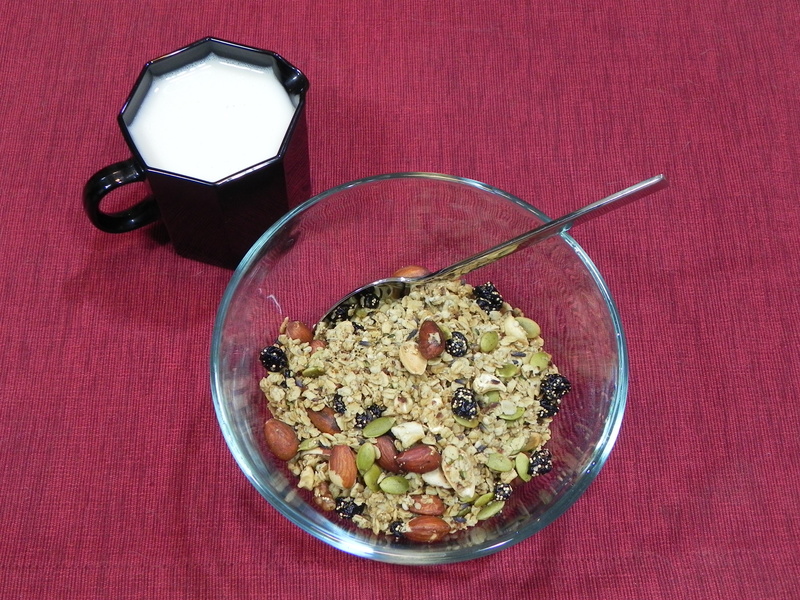 It needed a facelift, and I remembered that I used to love granola when I was in college. The brand I ate had dried blueberries and oats and it got me through many a sleepy morning. I gathered up bits and pieces of many granola recipes I found, but especially liked one that included lavender. That would add something different to breakfast and make granola more decadent. Granola is inherently vegan, unless it has honey, so no changes were made for that. It also doesn’t have high altitude issues. The only changes made to the ingredients are by you when you bake it. Pick any nuts and seeds, leave out the lavender, choose your favorite dried fruit. It all works. For baking the granola, I discovered a variety of cooking styles: higher temp, lower temp, stir, don’t stir. I went with the directions given by Alton Brown because he’s a food scientist so I imagine he’s worked his recipe to perfection. All I know is that it smelled heavenly while it baked and I couldn’t wait for morning. Preheat oven to 250F. In a large bowl, combine oats, nuts, seeds, amaranth, flax seeds, lavender, cinnamon and cardamom. In a small bowl, combine maple syrup, margarine, vanilla and salt. Combine both mixtures and pour onto 2 sheet pans. Cook for 1 hour and 15 minutes, stirring every 15 minutes to achieve an even color. Remove from oven and transfer into a large bowl. Add dried fruit and mix until evenly distributed. Cool and store in an airtight container.